Four primates could hold the key to saving thousands of lives across the globe. Each of these Anubis baboons was the recipient of a new heart, courtesy of an international team of researchers. With the new hearts, the baboons were able to live normal and healthy lives for months, which wouldn’t be all that surprising — except that the hearts came from pigs. According to a study published on Thursday in the journal Nature, the researchers managed to keep two of the baboons alive for 90 days before they euthanized the animals in accordance with the terms of the study. The other two baboons survived for 180 days before, again, the researchers put them down. Prior to this study, the longest a baboon with a life-supporting pig heart survived was 57 days, and 60 percent of recipients died within just two days, researcher Bruno Reichart told Scientific American. 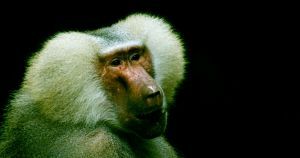 The key to the baboons’ extended survival centered on two elements. The first was the treatment of the pig heart just prior to transplantation. Through trial and error, the researchers discovered that pumping an oxygenated mixture of blood and nutrients through the heart before transplanting it into the baboon was more effective than keeping the organ on ice as it made its way from pig to primate. The second was the need to keep the pig heart from growing too large while in the baboon’s chest. To prevent that, the researchers focused on lowering the baboon’s blood pressure, weaning it off steroids as soon as possible, and treating it with medications designed to prevent excessive heart growth by stopping the build-up of blood platelets. Right now, more than 3,800 people in the U.S. alone are in need of a heart transplant, and about 600 of them will die this year while waiting. The problem is we simply don’t have enough donor organs to go around. If we can find a way to transplant hearts across species, though, we could craft a future in which anyone who needs a new organ can get one. However, before we consider moving on to human trials, we need to figure out a way to keep at least 60 percent of primates given life-supporting pig-heart transplants alive for a minimum of 90 days — with 10 primates surviving in total — according to the International Society for Heart and Lung Transplantation. The survival of these four baboons puts us one huge step closer to that goal. The post Baboons With Pig Hearts Bring Us Closer to Human-Pig Transplants appeared first on Futurism.